If you’ve been following along on the blog, you might have been aware of the new plugin we’ve been working on. The long-awaited release day is finally upon us. Whether you’re an existing Amazon SES fan and just haven’t found a good, reliable way to connect it to your WordPress site or if you’ve just been looking to offload your site emails to an email sending service but weren’t sure where to start, WP Offload SES is for you. Go ahead and check out our new WP Offload SES page if you can’t wait to try it out. We’re celebrating the launch with a discount of 40% off your first year – which you’ll see on the pricing page. For those interested in more details, read on. I’ve been wanting to tackle Amazon SES for WordPress since at least 2015, but it took us awhile to get to a place where we had the bandwidth to tackle it. And it wasn’t until I decided to reorganize the team into smaller groups focusing on our different products that Matt got the task to get started with development (with Jonesy as a reviewer) on our much improved version of an SES plugin for WordPress. 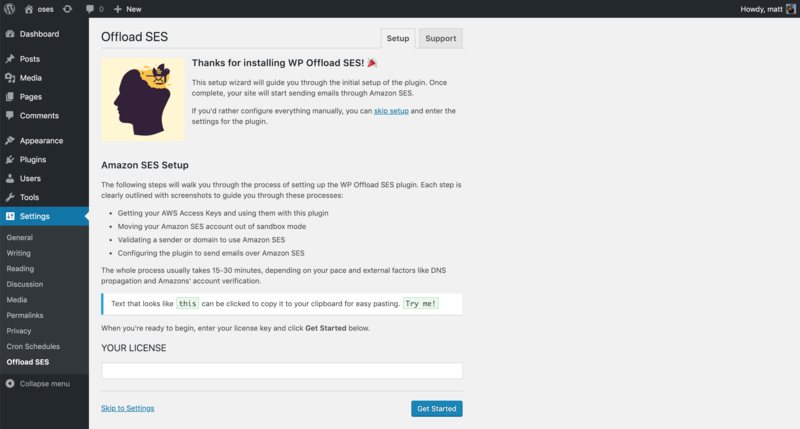 WP Offload SES helps you offload your site emails to Amazon SES. Site emails, or transactional emails, are all those emails WordPress would be sending to your users. Things like password resets, registration notices, comment alerts, form submissions and receipts are all examples of transactional emails. Basically almost anything that you’re not sending through your email marketing service provider. 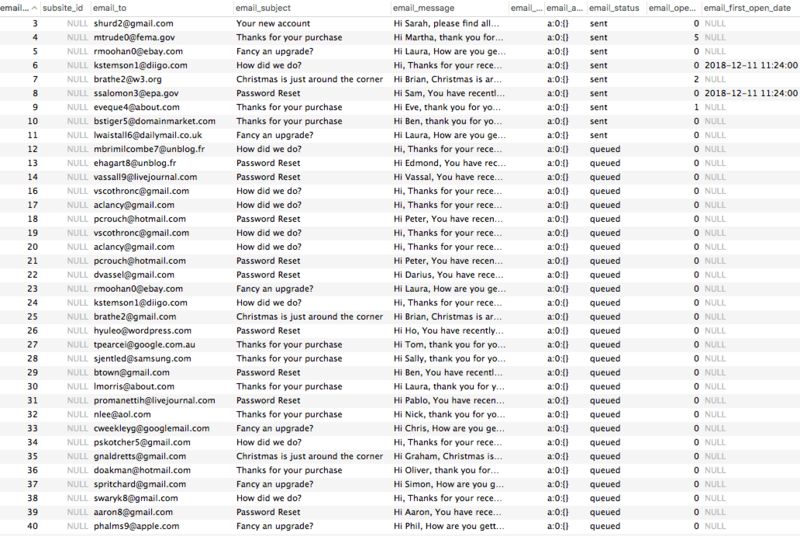 If you run a site that sends a lot of these emails (like an ecommerce or membership site), you might be familiar with the incredible volume of emails that your site can send on a daily basis. It can be literally thousands. A lot of these emails are business-critical emails as well so it’s a big deal if something happens that means they don’t get sent when they’re supposed to be. If you do nothing to configure email sending for your WordPress site, WordPress will end up using the PHP mail() function to send emails out of the box. The problem is PHP mail() function is a terrible idea for anyone who cares about their emails actually being delivered. Email service providers like Gmail and Outlook have spam filters that look to verify that an email that hits your inbox is actually coming from where it says it’s coming from – a test the PHP mail() function often fails. These unverified emails are such a red flag that they often may not even make it your spam folder. If you thought SMTP was the answer to your problem, you’d be mistaken. So maybe you avoid the PHP mail() function issues by using an SMTP plugin. Unfortunately, sending emails through your existing email provider over SMTP is prone to hitting rate limits, as standard email services like Gmail aren’t designed for the large number of emails that are sent when sending out invoices, password reset emails, support requests, etc. SMTP is also missing some key features like an email queue which means emails that don’t send successfully on the first try just get dropped. SMTP can get more complicated when trying to prevent client/human error. At a small firm/agency Matt used to work at, they would use an SMTP plugin and the client would change the email password without updating it in the plugin. They got complaints about lost emails frequently until they started using an email sending service. When you use Amazon SES, you’re required to configure proper authentication which lets services like Gmail know you are who you say you are, which means more emails in inboxes. On top of the authentication service, sending emails through Amazon SES means you’re using Amazon Web Services, one of the most reliable cloud platforms. Besides, if you’re already using services like Amazon S3 and EC2, using Amazon SES means managing accounts and billing is easier. And bonus, if you use EC2, you get 62,000 free email sends per month. WP Offload SES both makes it easy to configure Amazon SES for WordPress and adds capability that’s missing from Amazon SES. As much as we love Amazon SES, configuring it – especially for your WordPress site – can be a huge pain. Matt’s taken a look at this in some of his earlier posts as he was building the plugin, but basically Amazon SES is great as long as you don’t mind trying to make sense of poor documentation for hours on end and resorting to trial and error (including going down rabbit holes attempting to use outdated and neglected free plugins) to set it up. WP Offload SES simplifies this whole process with a step-by-step setup wizard, providing you with clear, concise guidance to ensure you understand what you’re setting up at each step. But even if you’ve managed to set up Amazon SES with your WordPress site, you’re still missing some key features you might want from an email sending service. Although it’s possible to enable tracking by tying together Amazon SES, Amazon CloudWatch, and Amazon SNS, it is complicated and painful to set up (as Matt learned last year). With WP Offload SES, you can implement it with the flip of a switch. Turning this on adds an invisible image to all outgoing emails to track how many times each one has been viewed. It also replaces every email link with a special tracking link. 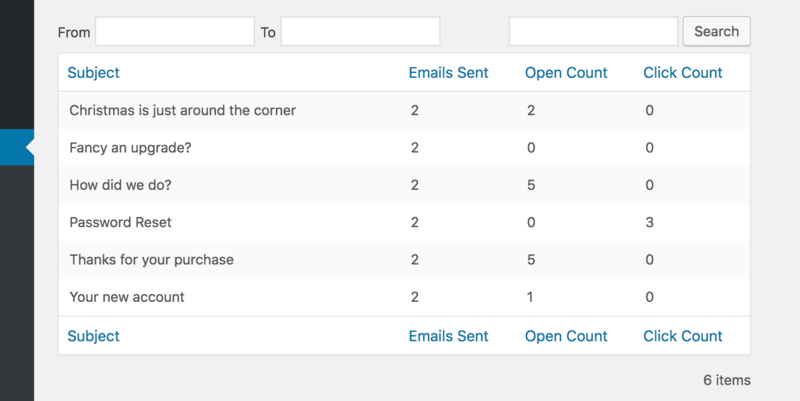 With open and click tracking turned on (with that simple switch in WP Offload SES), you might be curious to know how your emails are performing. Are people actually opening certain emails? Are they clicking links? With that information, you might want to update an email’s subject line and see if the open rate improves. Or update the email copy and see if more people click on the links. With WP Offload SES, you can access all of this instantly, from your WordPress dashboard. Every Amazon SES account has a max send rate. If you try to send more emails per second than your account rate, Amazon SES will return an error and refuse to send the email which could result in dropped emails if not handled properly. We put in a lot of effort building out a feature in WP Offload SES that fixes this for you: an email queue that monitors your send rate and can even send 100 emails per second through Amazon SES. WP Offload SES is aware of your SES account’s send rate and will stay within the limit, but in the event of a failed send (e.g. a networking issue) the robust queue system will retry sending those emails and keep track of failures. We’re excited about what WP Offload SES can help you do for your site emails but we’re only just getting started. If open and/or click tracking is enabled, WP Offload SES will automatically convert WordPress’ plain text notification emails into HTML. But currently there’s no way to customize the header and footer of these emails. Configurable templates will allow you to create your own template with a custom header, footer, sidebar, or whatever other elements you’d like to include in each plain text email. By default with Amazon SES, bounces and complaints are sent to you by email and that’s all. There is no report in the AWS console of exactly which emails have bounced or received a complaint, nor is there a way to handle them. We’re planning to show which emails have bounced as part of the WP Offload SES reports so you can clean up your email address list periodically. We also plan to have actions/filters you can hook into with code to automatically handle bounces and complaints. The AWS console allows you to review statistics about your reputation and do some reputation management. We’re planning to pull this data into your WordPress dashboard so you can manage it without needing to login to AWS. Amazon SES doesn’t log every email sent, let alone allow you to search for a sent email. Although WP Offload SES is currently logging every email sent to the database, there’s currently no interface to browse or search those emails. We plan to build that interface soon so that you can, for example, look up all the emails sent to a given email address. Let’s say that one of your users accidentally deleted a message that was sent to them. In the future you’ll be able to look up that email in the WP Offload SES log and resend it in just a few clicks. No more copying and pasting the content of the email you think they need because Amazon SES is missing such a critical feature. The ability for a user to unsubscribe from site emails is a significant feature missing from WordPress. For email addresses that have hard bounced, for example, it doesn’t make sense to continue sending them emails so we can instead automatically unsubscribe them from future site emails. In the future, you’ll have the option to include an unsubscribe link in the footer of your site emails to satisfy your users’ need to unsubscribe and better comply with ever-tightening privacy regulations. If you’ve been wanting to get a handle on your site emails by offloading them to a platform like Amazon SES but just haven’t had the time to devote to figuring it out for your WordPress site, WP Offload SES is worth considering. Read more about the features and pricing over on our WP Offload SES page. A big thank you to the whole team who helped us get this ready for you. We can’t wait to hear what you think. Do you have any questions about WP Offload SES? Are there any features you would like us to add? Let us know in the comments. This entry was tagged WordPress, Plugin, New Release, WP Offload SES, Plugin Development.